At Sheffield University Officer Training Corps (SUOTC) we run an annual adventure training expedition for the cadets and subalterns reaching the end of their third and final year of OTC. This is the culmination of all their training and development and a ‘last hurrah’ before they embark on civilian and reservist careers or set off for Sandhurst. 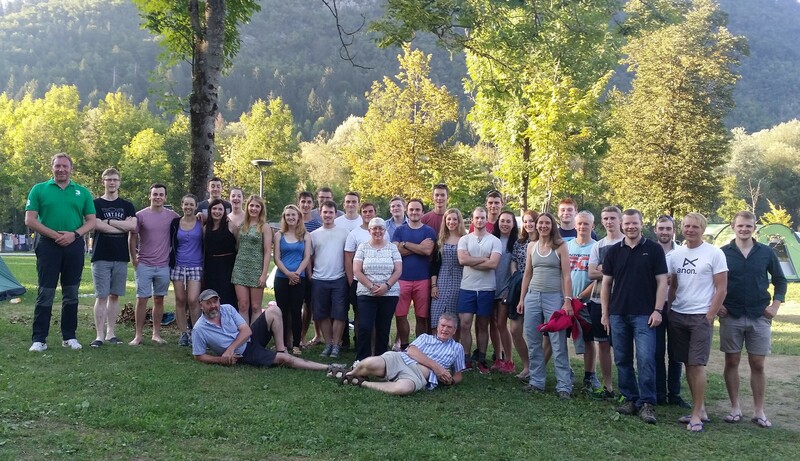 This year’s NORTHERN CUTLERS’ CLIMB ran from 14th August to 30th August and was to Bohinj valley and Triglav National Park in Slovenia, a perfect location to develop leadership and team work, improve navigation skills, and gain an understanding of mountainous environments all in a challenging, adventurous and frankly beautiful setting. Our party consisted of 24 students, and support staff of chefs, drivers and instructors to enable the training. Once the long slog of driving across Europe was out of the way the cadets were divided up into four groups. They’d each complete a summer mountaineering package including an attempt of Mt Triglav and rock climbing package meeting the requirements for both the Summer Mountaineering Foundation (SMF) and the Rock-climbing Single Pitch Foundation (RSF) certificates. Mt Triglav is the highest peak of the Julian Alps and considered almost sacred by Slovenians; its ascent being almost a rite of passage for them. Apparently they can’t call themselves true Slovenians unless they have reached its summit which, as an exposed rocky scramble of 2864m is no walk in the park. Accordingly half our students may claim to be adopted Slovenians, but the low cloud and high winds meant that it unfortunately just wasn’t possible for the other groups to summit. EX NORTHERN CUTLERS’ CLIMB has been a resounding success from my perspective. We were all awarded Summer Mountaineering Foundation which enables us to progress to the initial instructor level qualification of MLT. Additionally 12 of us were awarded Rock Climbing Foundation, an award which is rarely achieved in expeditions that I have previously experienced. This award is particularly important as it enables our students to potentially progress to lead rock climbing expeditions – which Sheffield and the surrounding Peak District area is ideal for. I found the ascent of Mount Triglav, at 2864m the highest point in Slovenia, particularly challenging especially with the inclement weather conditions but it made for some cracking log book days. In addition to the Adventurous Training (AT) activities, I noted that Slovenia, and in particular the surrounding Bohinjska Bistrica, are fantastic for multi or single activity trips. The locals are friendly and extremely accommodating. The additional activities available are especially impressive and the scenery is world class. Overall a very enjoyable expedition with some fantastic achievements and awards completed. The walking began with two days of build-up treks and culminated in a three day trek up Mt Triglav, the highest peak in Slovenia. During the build-up phase we learnt new, and developed existing navigational skills. The use of maps less detailed than the UK OS maps combined with the unfamiliar environment gave those of us with some navigational experience the excellent opportunity to practice and adapt our previously learned skills. The trek up Mt Triglav began with a steep and exhausting 2km height gain which included some scrambling and climbing. This exposure to risk in a controlled environment allowed us to really step outside of our comfort zones. We all felt a real sense of achievement when we finally reached the lodge at the end of a challenging first day. The lodges in themselves were a wonderful experience and allowed us all to appreciate both the Slovenian culture and cuisine! After waking early on the second day and conducting our own dynamic risk assessments we concluded that the weather made the final 300m ascent to the summit of Mt Triglav too dangerous. 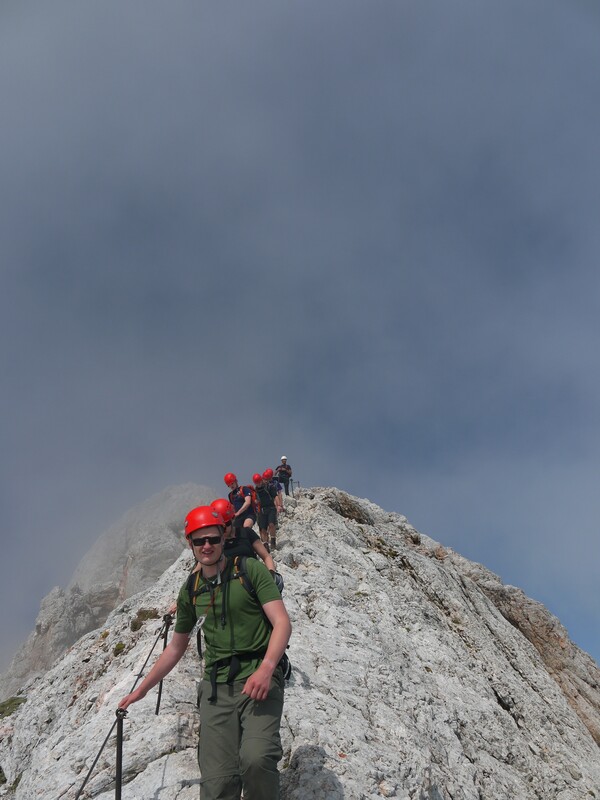 Whilst disappointed to not be able to summit Mt Triglav we still had a very enjoyable and rewarding day reaching the peak of Kanjavec, the second highest peak in Triglav National Park. I have really appreciated the chance to complete SMF through this trip and the opportunity to experience the challenges and rewards of walking and mountaineering. Before this trip the highest peak I had climbed was Whernside in the Yorkshire Dales, less than a third of the height of Kanjavec. This experience has changed my perceptions of mountaineering and I am already looking forward to my next adventure! My group did the rock climbing in the first week. Our experience of climbing was highly varied; some individuals were entirely new to the sport, whilst others had many years of experience. Despite this the rock faces around Bohinj proved an ample challenge to all, with numerous routes available to suit all levels of ability. Throughout our week of climbing we were instructed in the key principles of climbing, including rope work, belaying and climbing techniques. This allowed us to gain the Rock-climbing Single Pitch Foundation award. The first step in working towards being qualified to lead further expeditions ourselves. Alongside the hard skills many of our group were also able to develop soft skills. Since outdoor rock climbing was unfamiliar territory to the majority it was initially daunting. It was however tackled with a keen vigour allowing those involved to push themselves beyond what they initially thought possible. The trip has sparked a keen interest in climbing in several members of my group, and organising subsequent trips has been a hot topic of conversation. Overall the trip has been a fantastic experience for all in attendance. Not only has it allowed us to push ourselves physically, but also to expand our comfort zone preparing us to push onto greater goals in the future. 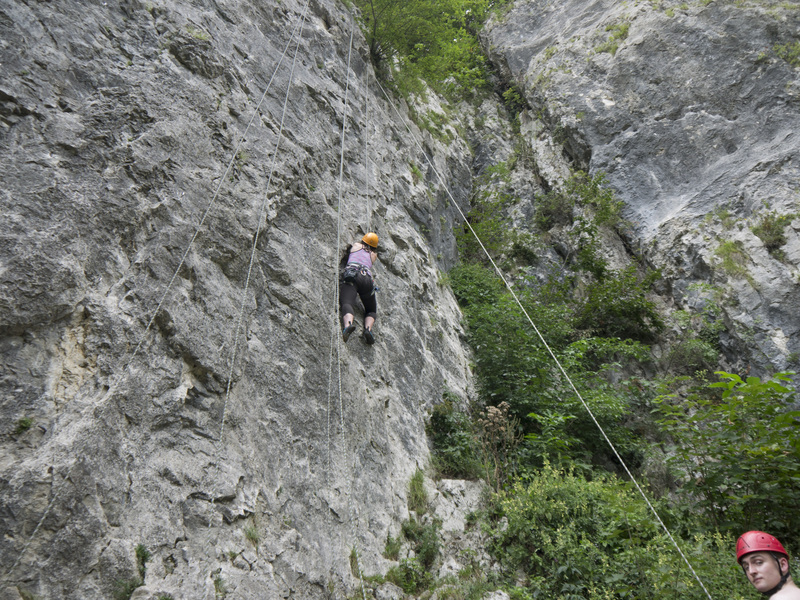 Rock climbing is an active and challenging endeavour for anyone whether experienced or new to the sport. My group found this exactly true, with a mix of climbing abilities there was a lot to be taken from the week’s instruction by everyone. The three new climbers in the group learnt all the basic skills required to be competent climbers in both indoor and outdoor settings being introduced to knot work, foot/hand placement, equipment protection, and everything else in between. The more experienced among us got the fantastic opportunity to hone our abilities as well as go through all those skills that are essential to be effective and, perhaps more critically, safe climbers. On top of this the RSF qualification was achieved by all my group, formalising our new found competency and acting as a gateway to becoming rock climbing instructors. Aside from the technical aspect of the course, I think we all took a multitude of other very valuable positives from our week on the crag. Some were quite individual, for instance for the person who found themselves challenging a fear of heights in a remarkably ‘head on’ manner. Others were shared by all, for example trust; it being particularly difficult to allow all of ones weight to dangle on a rope 20m up a jagged rock face without explicit faith in the belaying ability of the person on the other end of your rope. Trust, of course, is a key aspect of team work, something we as a group developed in spades. The practical implications of this are far ranging; from simply cooperating in washing the mountain of dishes together as a group in a timely manner, to many more workplace activities that involved a group task being completed efficiently. In all, an excellent time was had by every member of the group, some of whom have been inspired to start rock climbing as a regular hobby- high praise by anybody’s standards. One of our objectives was improving navigation skills. Sgt Bennett had a novel approach to this. We were to envisage the leg of the route we were about to lead and make up a story about the distance, what the terrain would be like, and what we would see. This may sound a little twee, but something about the troll bridges, or gathering equipment for a whale hunt clicked in relating a map to the real world with one of our girls as she blossomed from self-proclaimed remedial navigator to a maps master! Another objective was for the students to get foundation qualifications, but an even greater benefit is if they go on and get instructor qualifications that they can use to help future generations have a similar opportunity. Sure enough five have already applied for instructor courses. On reaching the summit some grin, some weep!